A newly-released British military file has finally admitted that a British Army helicopter, said to have crashed in a 1978 air accident, came down trying to avoid IRA gunfire. Among those on board was one of the most senior British Army/SAS members killed during the conflict, but for almost four decades the exact circumstances of his death have been kept secret by the Crown forces. An official report into the incident, released following a Freedom of Information request, records that shortly after 5pm on 17 February 1978, Ian Corden-Lloyd, c/o of the 2nd Battalion Royal Green Jackets, took off from the British Army base at Bessbrook, County Armagh. The senior officer took off after reports that a patrol from his regiment was under heavy attack from an IRA active service unit near Jonesborough. The arrival of the Gazelle helicopter prompted the IRA unit to break off the attack. Fire was turned on the aircraft, which lunged sideways before crashing. Corden-Lloyd was killed in the impact, while two other Crown force members were also injured. At the time, the IRA released a statement claiming the strike. A full investigation into the circumstances surrounding the crash was immediately launched by the Army, but its findings were kept secret for 37 years. Finally, after a Freedom of Information request, the official air accident report has now been released into the British National Archives, and confirms that the helicopter did crash as a result of IRA actions. “A burst of tracer came up from across the border,” states the official report. The lengths to which the British Air Force would go to try to hide the the damage inflicted on their operations by the IRA has also been revealed this week by a former RAF pilot regarding an earlier attack. 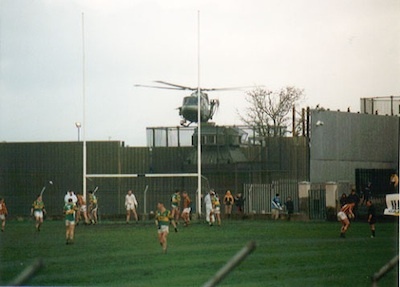 Part of the Gaelic sports grounds at Crossmaglen in south Armagh had been occupied for use by the British Army, and IRA rocket attacks on helicopter flights into and out of the base were a frequent event. On the evening of April 15, 1976, an RPG-7 rocket struck one helicopter as it came in to land. At the time the RAF claimed the chopper had only been hit “a glancing blow” by the rocket-propelled grenade, but it has now been confirmed that the damage was far more serious, wrecking one of its engines. In a reckless act of bravado to play down the damage, the RAF chose to fly the crippled Wessex to Bessbrook army base on a single engine to play down the damage, endangering civilians and the pilot alike. And in a bizarre attempt to maintain the lie, the RAF made up another helicopter to look like the one which had been disabled. “They thought, ‘Right, we don’t want the IRA to think they’ve won here,’” admitted pilot David Morgan.